Have you seen that new show on Netflix? You know the one that everyone’s talking about? Of course you haven’t—you spend all your time looking for link building opportunities. That ends now (well, as long as you beat the 48-hr timer). 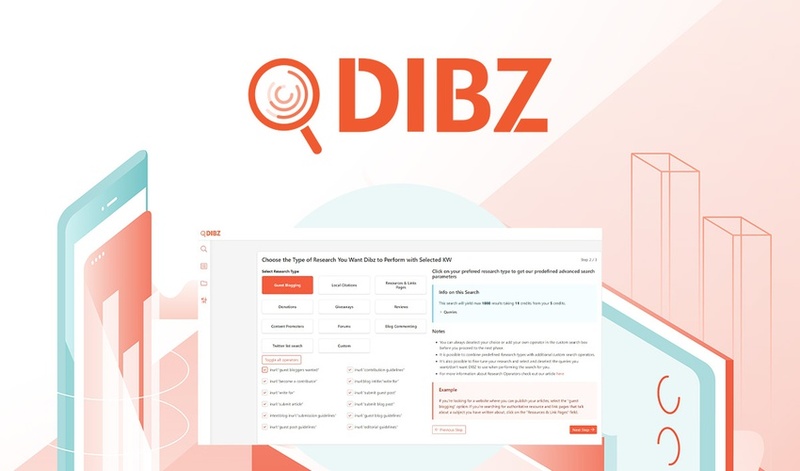 Grab access to Dibz and simplify your link building process! You want the best of the best and that’s what Dibz is going to give you. Dibz collects data from industries’ top content providers so that you can conduct simpler, tailored searches. Thanks to custom search parameters and a spam algorithm, Dibz automatically filters out irrelevant or spammy prospects and lets you arrange the rest by one or more metrics. All you’ll have left to do cherry pick top-notch results, import them into your outreach tool, and start your campaign. If you’re running an agency, that’s great because Dibz offers unlimited clients and the ability to organize your work and keep everything segmented in one dashboard. You’ll also have unlimited team/user places, which gives out the power to invite as many people from your team as you want. And when it comes to your work within Dibz, you can sleep easy at night knowing all your searches will be stored in the database for as long as you want or need them. Giveaways. Search Dibz for specific giveaway and sweepstake opportunities using a preset search template. Content promotion. Promote your content by locating relevant platforms that republish content they find interesting. Guest blogging. Find personal, company, or industry blogs which publish guest posts by searching keywords, niche, or topic of interest. Reviews. Look for sites that review products and services and link to suppliers. SEO professionals are loving how easy the Dibz Starter Plan is making their lives. And now, you can also quit spending hours looking for outreach opportunities. Get lifetime access to Dibz with 20 monthly credits for a one-time payment of just $49! Monthly credits can be used on Dibz's predefined spam algorithm and all social signals. And if you want more monthly credits, you can stack this deal up to 5x and unlock 100 monthly credits (each code brings 20 monthly credits)! Additional data (Ahrefs and Hunter.io) is not included. However, Dibz has made it easy for everyone who doesn't have Ahrefs account to actually get the metrics from Ahrefs at a fraction of the cost you would pay when getting it directly from them. Find the best link building opportunities now! Unlike other tools, Dibz is a 100% cloud-based solution that has a unique spam algorithm with 17 different parameters. This means you can have a fully personalized custom parameter setup based on your needs. The competition isn’t giving you that. Plus, don’t even think about trying to find a free tool that does what Dibz does because it doesn’t exist. Oh, and Dibz is built by Four Dots marketing agency — you know, the group behind former hit AppSumo deal, Reportz.io. If you are prospecting for high-quality links and potential collaborations, Dibz is a must-have tool. Not only is it going to do the heavy lifting for you, but it will also give you the best possible results based on you want. Get lifetime access to Dibz now!